A fresh pink presentation bouquet of beautiful mixed blooms including gerbera daisies, frilly stock, gladioli, orchids, roses and lisianthus. Clustered amongst lush ferns and greenery, this spectacular flat-backed presentation bouquet is perfect for handing to someone at a special event or ceremony, for a congratulations or farewell gift. 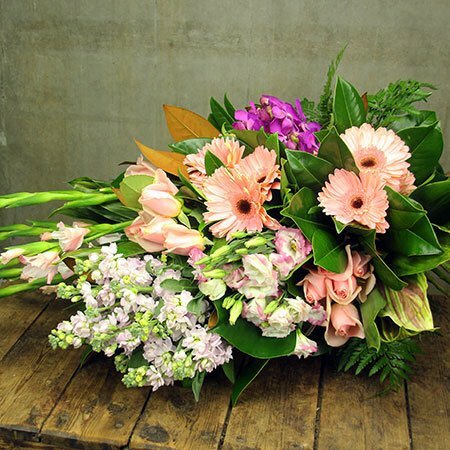 Order this bouquet via our online florist shop or by calling the team on 1800 66 66 46. *Please note: The pictured flower bouquet is exclusive to Sydney delivery only. 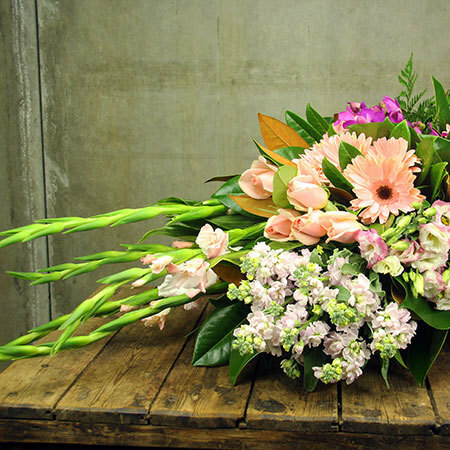 For flowers delivered outside Sydney, the team will coordinate your order via an affiliate florist network to recreate our style, content and presentation as closely as possible.